This is itinerary we've designed for clients. Customized for each client. Meet driver at your train arriving to Bayeux. Wearing a jacket and tie, he will be holding a personalized welcome sign with your name and assist with your luggage. He will accompany you directly to your hotel in Bayeux. Once settled in, you may visit, on your own, the Bayeux Tapestry and discover this medieval treasure of a town. Your driver will have your with 'VIP no waiting in line' tickets for the tapestry museum. Check in and Overnight Hotel Villa Lara, 3 nights. Double deluxe room. Day 2. Explore Bayeaux. Although Bayeux is only a short distance from the D-Day invasion beaches, it was spared bombardment during the historic invasion. Today, it is a small town with cobblestone streets lined with shops and Norman style timbered houses dating from the 17th century. 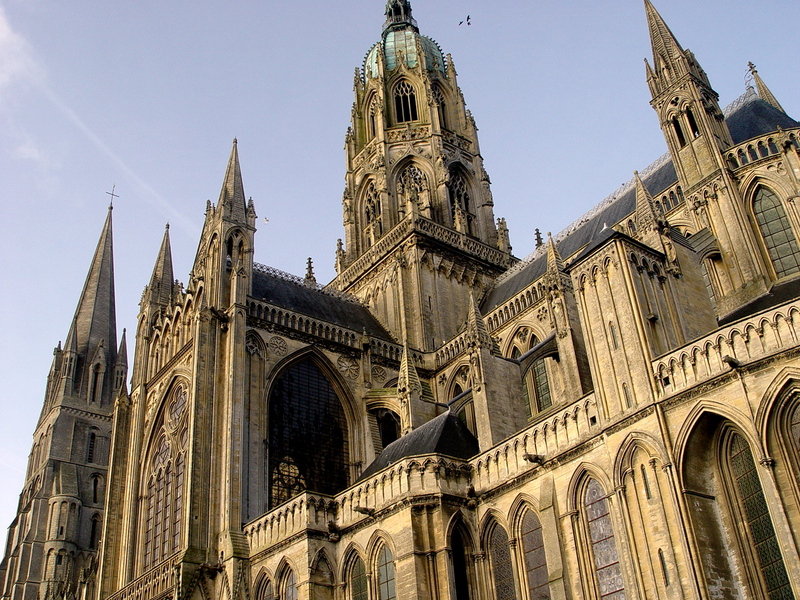 Bayeux’s 13th through 19th century Gothic cathedral of Notre Dame de Bayeux is in the town’s center. It has 11th century Romanesque towers, a groin-vaulted crypt, which is decorated with 15th century frescos. The work was initiated by Bishop Odon de Conteville (1049-1097), born of the same mother as Willam the Conquerer. The bishop had been rewarded for his participation in the Battle of Hastings. The cathedral was dedicated on July 14 1077 . One of the supreme achievements of the Norman Romanesque, the Bayeux Tapestry miraculously survived over nine centuries. This large embroidery tells the story of the Norman Conquest of England in 1066. It is an invaluable historical representation of the arms, costumes, manners and ships used by the Normans (led by William The Conqueror) prior to the invasion of England. The Tapestry stretches 231 feet long and is 19.5 inches wide. Its exceptional length, the harmony and freshness of its colors, its exquisite workmanship, and the genius of its guiding spirit combine to make it endlessly fascinating. expectations. Should you have a D-Day veteran in your their family, please tell your us. He will be happy to include this in the presentation. leading to the invasion and following June 6th, 1944. Lunch will be arranged in a charming café near the beaches (very simple with fresh food) where the historical discussions will continue. Payable on spot, it is customary to pay for the historian’s lunch. The historians have spent a large part of their careers “keeping the memory of the soldiers alive” through presentations and private visit for families of veterans, military officials and discerning travelers. 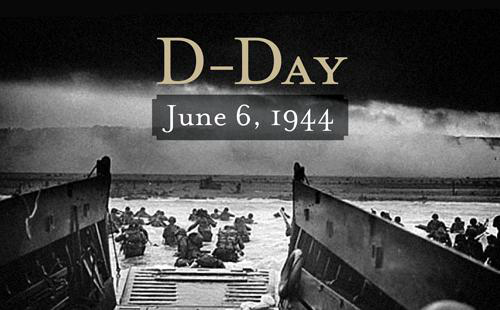 It is highly recommended that you watch the films: ‘Saving Private Ryan’ and the ‘Longest Day’ before the tour. The following is the list of the main sites you will visit. This itinerary is not limited to these sites. Your guide/historian enjoys showing the lesser known sites along the way as well. Objective: to get off the beach as quickly as possible in order to reach the top of the bluff. primarily due to the challenging topography. The allied air-bombing and naval bombardment, planned to discourage the enemy, were off target which left the four exit roads continuously blocked by the German defenders. The objective of the Omaha Beach Invasion was nearly impossible to attain. Learning about the massive tides on D-Day, the hidden German fortifications and the strategical gun emplacements, the visitors to Omaha Beach easily grasp the notion of the extraordinary courage and sacrifice needed by the soldiers on June 6th, 1944. Site of burial of a third of the American dead of the Normandy Campaign are buried. This Cemetery, extends over 172.5 acres, and is one of fourteen permanent American World War II cemeteries constructed on foreign soil. It contains the remains of 9387 servicemen and women killed for our freedom. The American Cemetery conveys an unforgettable feeling of honor, peace and serenity. ‘Alone time’ is always proposed to guests. monument was created by France to honor elements of the 2nd Rangers Battalion under the command of LTC James E. RUDDER which scaled the 100-foot cliff. famous movie: The Longest Day, you will visit the famous church tower upon which the American paratrooper John Steele landed and became entangled as he parachuted into Normandy on June 6th. An actual mannequin of Steele has been hung with parachute on the church tower to commemorate his courageous jump. The American beach where everything went on schedule except one problem, they were in the wrong place. This was the furthest west of the five beaches designed for the D-Day Landings in June 1944. Located at the base of the Cotentin Peninsula, it was added by General Dwight Eisenhower to the original D-Day plan to ensure the early capture of the vital port of Cherbourg, at the north of the peninsula. The landing at Utah was scheduled for 06:30 and the Allied force came from the US 4th Infantry Division. The plan for Utah included an airborne drop by the US 82nd and 101st Airborne Divisions at various points two to five miles inland of the beach. The airborne drop worked well. The seaborne landing did not go to plan - though ironically, a battle against Nature was to be of great value to the Allies. On the first day of the landings at Utah, 20,000 men had been landed and 1,700 military vehicles. Casualties were less than 300 men. Though the war in the Cotentin Peninsula was not yet over, the achievements at Utah were immense, even if Nature had given a helping hand. Day 3. Experience the Pays d'Auge. 9:00am. Your driver guide* will greet you at hotel’s lobby and accompany you to a full day discovery in the gorgeous region of 'Pays d'Auge'. The day revolves around discovering Normandy's authentic villages, local artisan methods of making cider, and the present and past "ways of life" in the region. Throughout the day, you will have the opportunity to have unique experiences in small local villages, visit rural areas and have personalized meetings with local residents who are happy to share their vision of Normandy. The tour ends in Honfleur where you where you have reservations at the Maison de Lea, a quiet hotel with discreet charm and an atmosphere to be savoured in its comfortable lounges with open fires, thoughtfully designed rooms and airy walled and verdant courtyards. Situated in the historic heart of Honfleur close to the harbour, the restaurants and town centre shops and galleries. the knowledge to know that Beauvron en Auge was an exceptional site with its original 17th century market hall and town square lined with half timbered period homes. In 1972, Vermughen shrewdly set up the Association for the Preservation and Enhancement of Beauvron en Auge which protects the villages from unsightly construction. who is dedicated to preserve the 150 year old tradition of making cider and calvados (brandy) on the family domain. The presentation is given a relaxed conversational manner and the property is in its authentic untransformed state. This is an opportunity to see the 'Real Normandy' at its finest. Film Festival and the famous Yearling Sales. Two luxurious events that make this untypical beachside resort, an international reference in Normandy. At the end of the day arrival Honfleur and check into your hotel Maison De Lea. for position on the quays, as do galleries and restaurants. Nestled between two hills, the Côte Vassale and the Côte de Grâce, Honfleur is where the landscape of the Pays d’Auge and the estuary of the River Seine meet. A charming fishing port with traditional Norman architecture, Honfleur looks much as it did when Claude Monet was a frequent visitor. Monet first met Honfleur-born Eugène Boudin in Honfleur, and would subsequently drag the whole band of “renegade artists” - Courbet, Corot, Sisley, Pissarro and Renoir - to paint at the Saint Simeon farm. Claude Monet once said “If I am a painter, I owe it to Eugène Boudin”. From this promontory, they endlessly painted the colors of the Seine bay and surrounding area, earning them the title of "Estuary Painters". Honfleur looks so utterly enchanting, it is hard to remember that it was built essentially for commerce. Its harbour sits in a great location, tucked away on the southern side of the Seine’s estuary. During the Hundred Years War, the French king had this strategic spot fortified, but that didn’t stop the English taking over for several decades. Overnight hotel Maison De Lea. You will be greeted by an English speaking driver at lobby of your hotel who will accompany you to Hotel Castelbrac in Dinard which is a village in front of St Malo. There is a 10 min water shuttle that goes back and forth from Dinard to St Malo throughout the day. 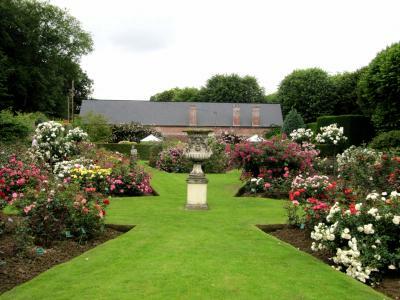 Along the way, you will stop into the famous Chateau Balleroy for a private visit of the Chateau. This private visit lasts 45 minutes. Arrive Mt. San Michele, tour with a private guide. Tickets are included no waiting in line. Exact hour to be determined by seasonal tide table you will be met by licensed Guide for a special active experience: Crossing the Bay of Mont Saint Michel. You will visit one of Europe's most unforgettable sights. 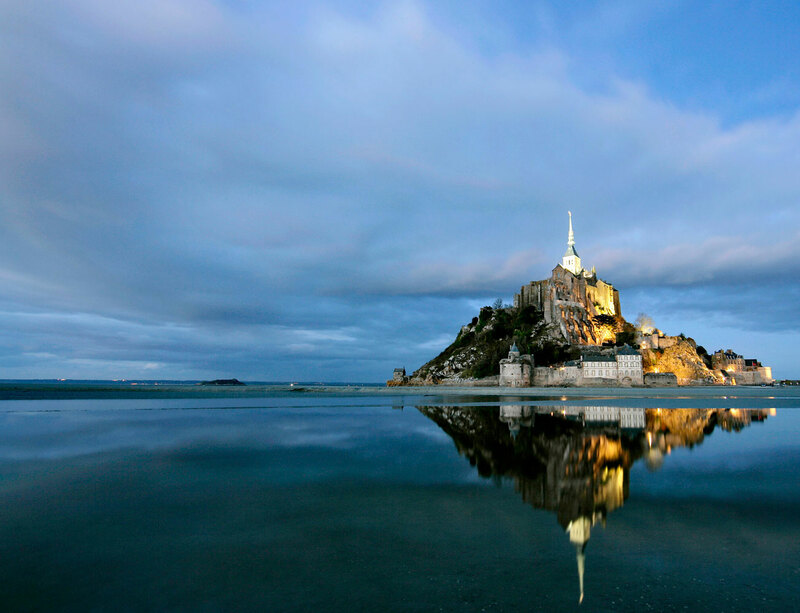 Set in the mesmerizing bay where Normandy and Brittany merge, the Mont Saint Michel draws the eye from great distances. (can be done next day). Discover the Bay of Mont Saint Michel. Most extraordinarily, you will experience the “Mascaret”, which is the tidal wave which invades the river “Couesnon " announcing the arrival of the sea; discover the flora and the fauna, the history of Tombelaine and pilgrimages, the legends, the phenomenon of tides and maybe even see seals! He will explain how this staggering location has long inspired awe and the imagination for hundreds of years. The story of how the mount turned into a great place of Christian pilgrimage is colorful. Aubert, bishop of the nearby hilltop town of Avranches in the 8th century, claimed that the Archangel Michael himself pressured him into building a church built atop the island in the middle of this bay with volatile changing tides. After the crossing, you will be able to discover the interior of the Mont on your own (remember to bring your Fast Pass entrance tickets!). A sunset dinner on the ramparts will be perfect or sunset cruise. Arrival hotel Castelbrac and check -in 2 nights, Superior room with bayview. we suggest a literary tour "All the light we cannot see"
Dinard, set on the dramatic coastline of Brittany in northern France, has long been a fashionable destination for holidaying French urbanites. Characterised by its long, and often wide, tree-lined boulevards that converge on elegant squares full of chic restaurants and creperies, the city juts out seawards and is, therefore, surrounded on three sides by beaches and the sea. For sailing, watersport and beach enthusiasts, it means that the coast is always within easy walking distance away. Dinan is in the eastern part of Brittany, south of Saint Malo and Dinard and north of Renne. Dinan, a beautifully preserved medieval walled town about 20 miles south of Saint Malo. Lovely cobbled streets filled with art galleries and 15th-century houses, you can also walk along the 13thcentury ramparts for stunning views of the Rance River and old town. The bay of Saint Malo has the highest tidal range in Europe, in Spring and Autumn. The Gulf Stream off the coast of Saint Malo enables the town to enjoy a temperate maritime climate, with a narrow range of temperature. In the Middle Ages, the walled city was on the border between the Duchy of Brittany and the Kingdom of France. Two centuries later, in order to protect its commercial interests, St Malo turned into a city of 'privateers'. These great sailors explored the new sea routed and the town profited from the discovery of the Americas. After the India Company was founded in 1664, the ships of St Malo traders accompanied the French Nave and led large expeditions to the South Seas. Protected by its ramparts reconstructed by Vauban, and completed in 1737, the port city remained impregnable. This is a 2 hour transfer. Along the way, you will stop in the quaint village of Giverny for a light lunch and visit to Claude Monet's Home in Giverny. You will be given 'VIP' fast pass tickets which allow you to enter through the side door. Visiting Monet’s home is like discovering the private life of this legendary artist. You will explore the grounds following the colorful lanes, full of different flowers, the kitchen in his home and the reception rooms used to entertain the greatest artists of the Impressionist era. You will go through tunnels, over bridges and down pathways to access various gardens. The most famous elements to be seen at Giverny: the Japanese Bridge and the Water Lilies. A little history about Monet…..Monet settled in Giverny in 1883 with his children, his girlfriend Alice (who became later his second wife) and her children. After the death of his first wife, he looked for a long time for a place to live and paint. He discovered this quiet rural village, surrounded by a great variety of natural landscapes. He was 43 then and had painted more than 800 canvases. His name started being known. In Giverny, he was able to give the best of himself in his two passions : gardening and painting. The structure of his paintings resembled that of his gardens: patchworks of intricatestitches of color side by side. Arrival Paris or CDG airport.